Here’s a terrific excerpt from “Swimming Anatomy” published with permission of Human Kinetics. “To move your body efficiently through the water, a coordinated movement of the arms and legs must occur. The key to this coordinated movement is a strong core, of which the muscles of the abdominal wall are a primary component. Besides helping to link the movement of the upper and lower body, the abdominal muscles assist with the body-rolling movements that take place during freestyle and backstroke and are responsible for the undulating movements of the torso that take place during butterfly, breaststroke, and underwater dolphin kicking. The abdominal wall is composed of four paired muscles that extend from the rib cage to the pelvis. The muscles can be divided into two groups—a single anterior group and two lateral groups that mirror each other. The anterior group contains only one paired muscle, the rectus abdominis, which is divided into a right and left half by the midline of the body. 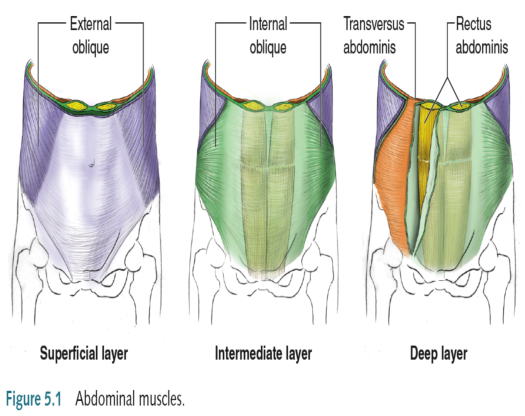 The two lateral groups each contain a side of the remaining three paired muscles—the external oblique, internal oblique, and transversus abdominis (figure 5.1). In human motion and athletics, the abdominal muscles serve two primary functions: (1) movement, specifically forward trunk flexion (curling the trunk forward), lateral trunk flexion (bending to the side), and trunk rotation; and (2) stabilization of the low back and trunk. The motions mentioned earlier result from the coordinated activation of multiple muscle groups or the activation of a single muscle group. The rectus abdominis, popularly known as the six pack, attaches superiorly to the sternum and the surrounding cartilage of ribs 5 through 7. The fibers then run vertically to attach to the middle of the pelvis at the pubic symphysis and pubic crest. The six-pack appearance results because the muscle is divided by and encased in a sheath of tissue called a fascia. The visible line running along the midline of the body dividing the muscle in two halves is known as the linea alba. Contraction of the upper fibers of the rectus abdominis curls the upper trunk downward, whereas contraction of the lower fibers pulls the pelvis upward toward the chest. Combined contraction of both the upper and lower fibers rolls the trunk into a ball. The muscles of the two lateral groups are arranged into three layers. The external oblique forms the most superficial layer. From its attachment on the external surface of ribs 5 through 12, the fibers run obliquely (diagonally) to attach at the midline of the body along the linea alba and pelvis. If you were to think of your fingers as the fibers of this muscle, the fibers would run in the same direction as your fingers do when you put your hand into the front pocket of a pair of pants. Unilateral (single-sided) contraction of the muscle results in trunk rotation to the opposite side, meaning that contraction of the right external oblique rotates the trunk to the left. Bilateral contraction results in trunk flexion.